The Pattern: The pattern is taken from a photo of an early Stradivari violin, enlarged to viola size. I use photographs covered with clear packing tape to make quick, accurate templates. Wood for Blocks: Sections of spruce are sawed on the tablesaw to have the right height. These blocks are Adirondack (red) spruce. 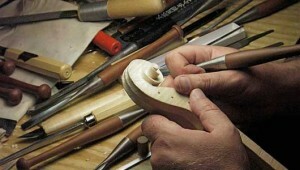 Cremonese makers used either spruce (the Amati and Guarneri families) or willow (Stradivari). Drawing a Corner: Corners and end block shapes are traced from the template, but the marks are just guidelines—ultimately I do what my eyes tell me is right. Shaping a Corner: Cremonese makers weren't too careful about squareness, but the lines of their work were always attractive. It's more important to look at the corners and compare them against each other than to follow the template marks. I do this against a bright window so I can see only the outline without any confusing extraneous details. Ready for Ribs: At this point, since the blocks were glued on while the form was resting on a flat surface, one side (the top) is in a single plane. That's the reference for the plane of the ribs from this point on. With the underlying structure established, it's time to work on the ribs themselves.